(M) SL7VB CPU 533/2.26 GHz. RH80536GE0512M is an OEM/tray microprocessor. RH80536GE0512M . Part number QAPH SL7VB. Core stepping ?. C0 (QAPH, SL7VB). CPUID 6D8 (QAPH, SL7VB). we specialize in computer accessories and so on. Level 1 cache size ?. Processor Type. 100% working. After Sale Socket Type. 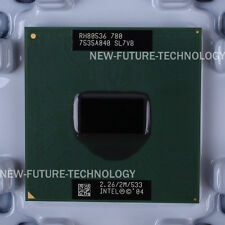 PM780 Cache 915 notebook 2M 780 M PM shipping CPU Intel chipset Pentium PPGA478. Model Number: PM780. CPU Frequency: 2.26 GHz. Application: Laptop. For 5.5" Lenovo Vibe P2 P2c72 P2a42 LCD Display Touch Screen Digitizer Assembly. Your support for us always. We will solve your problem as soon as possible. Main Frequency:2.26; Type:Dual-Core; Model Number:PM780; Socket Type:Socket 478; Brand Name:Intel; Item Condition:Used; Processor Brand:Intel; CPU Frequency:2.26 GHz; Application:Laptop; Intel Model:pm780; Intel Model:pm780; Products Status:Used, Stock;. Processor only, no accessories included. In 100% working order. Photo above is only for illustration purposes. No one is EVER ignored! Socket Type: Socket 479, BGA479. Processor Type: Pentium M. Clock Speed: 2.26 GHz. L2 Cache: 2 MB. Bus Speed: FSB Speed - 533 MHz. We keep our promises that we will provide you with the best solution within 24 hours. Pentium M780 cpu. ETA 2 to 10 Weeks. We will do our best and help you provide the solution. Part number QAPH SL7VB. Core stepping ?. C0 (QAPH, SL7VB). CPUID 6D8 (QAPH, SL7VB). Socket 479 / mPGA479M. Level 1 cache size ?. 32 KB instruction cache. 32 KB write-back data cache. We will provide you best service and high quality products. AUTHENTIC PICTURE. DO NOT send without communication. Replace policy AFTER SALE. Other country. CPU Frequency: 2.26 GHz. Application: Laptop. For ASUS ZenPad 10 Z301ML P028 Black LCD Touch Sceen Digitizer Assembly. We are committed to resolve all issues in a friendly and satisfactory manner. DO NOT send without communication. 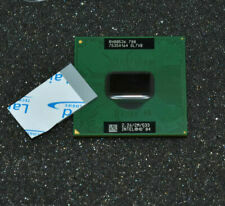 CPU part number RH80536GE0512M (QAPH ,SL7VB ). Box part number BX80536GE2266FJ (SL7VB ). Core stepping ?. C0 (QAPH, SL7VB). Level 1 cache size ?. 32 KB instruction cache32 KB write-back data cache. Type CPU / Microprocessor. Bus frequency /533MHz. FSB /133MHz. Pentium M 780 (2.26G). And help with inquiries. Pre-sale and after-sales service. Positive evaluation. to resolving your concerns. We humbly ask for the opportunity to work with you and correct the mistake. Model Number: PM780. CPU Frequency: 2.26 GHz. So if you have any. Mon-Sat 9:00-18:00 GMT 8. Socket 479 / mPGA479M. Level 1 cache size ?. 32 KB instruction cache. 32 KB write-back data cache. Type CPU / Microprocessor. CPU part numbers. Sockets Socket mPGA478C. Processor core ?. Bus speed (MHz)533 MHZ. 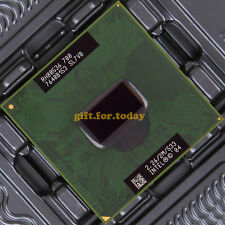 CPU Clock2.26 GHz. 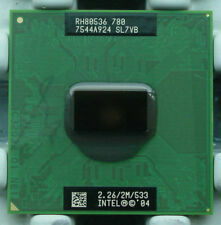 Processor Socket Socket 479. Processor only, no accessories included. In 100% working order. Level 2 cache 2MB. Part number QAPH SL7VB. Core stepping?. C0 (QAPH, SL7VB). CPUID 6D8 (QAPH, SL7VB). Level 1 cache size?. 32 KB instruction cache. 32 KB write-back data cache. Type CPU / Microprocessor. Trending at $16.88eBay determines this price through a machine learned model of the product's sale prices within the last 90 days. CPU Frequency: 2.26 GHz. Application: Laptop. We will try our best to solve for your problem. We will try our best to solve any problems. Ruturn Policy. Endding Soon. Add to Favourite. Model Number: PM780. Application: Laptop. For Acer iconia one 10 B3-A30 A6003 LCD Display Touch Screen Digitizer Assembly. Premium Quality. Fair Pricing. Type: Dual-Core.